Paramount announced this morning that the newly-released Transformers movie has become the biggest selling HD DVD title ever. With 190,000 copies sold in North America in its first week, the HD DVD-exclusive title is also the best-selling single format HD movie so far. 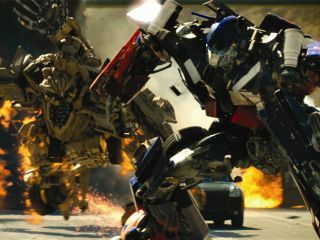 The Hollywood studio also said that in the first week alone, over 20 per cent of those who bought the Transformers HD DVD connected to the web-enabled features on their Toshiba players. One of the main trump cards of Toshiba's HD DVD players is that they all have Ethernet ports for connecting to extra interactive features that Paramount couldn't fit on the disc. Back in August, both Paramount and its DreamWorks Animation arm announced that they would be shunning the Blu-ray format in order to exclusively support the HD DVD format. Since then, all titles from Paramount Pictures, DreamWorks Pictures, Paramount Vantage, Nickelodeon Movies and MTV Films have been made available only in DVD and HD DVD versions. Is format war a cold war? Firstly, HD DVD movies are "less expensive to produce", i.e. they can be rolled out on re-tooled DVD production lines rather than requiring brand new technology. And secondly, Paramount believes that HD DVD is superior to Blu-ray because of its "market-ready technology". By this it means that HD DVD players conform to a finalised software and hardware specification. Blu-ray, in comparison, has yet to fully implement the interactive features using BD-Java or make an Ethernet port (for net-connectivity) mandatory on disc players. So what with Transformers being the biggest blockbuster movie of the year, it's not that surprising that it's sold so well. It will be seen as a small victory for the HD DVD format though. Both sides like to parade sales figures in front of us and these ones will no doubt give Blu-ray a kick in the teeth.